Click on Open New Ticket at the top of page. 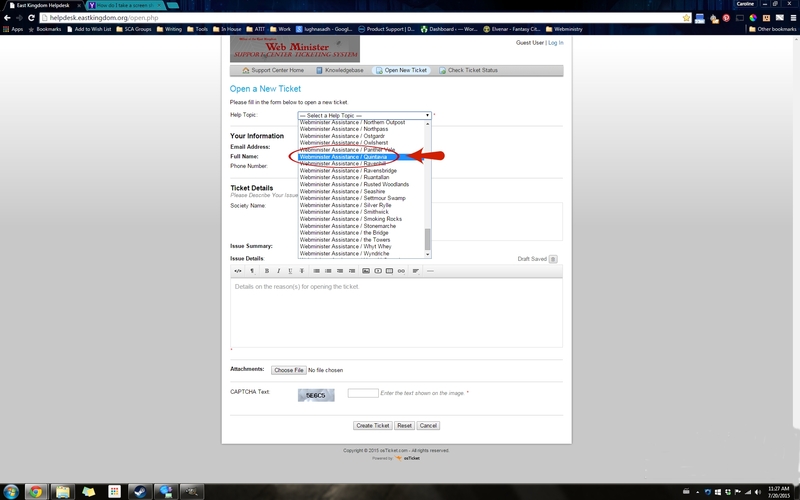 Select Webminister Assistance/Quintavia from the drop-down menu. This is what will direct it to me personally. Fill out the remainder of the form with the necessary information. Click on Create Ticket when the form is complete to send it on it’s way! So What If It’s Not Our Site That Has a Problem? Fortunately there are other webministers associated with almost all of the EK websites. If you are having a problem with a particular site or list feel free to submit a ticket. The drop-down list has options for all of the Order Lists, the EK calendar, as well as an option for General Inquiry. If you have any other questions please feel free to post here or email me and I will make an addendum to this as an FAQ.